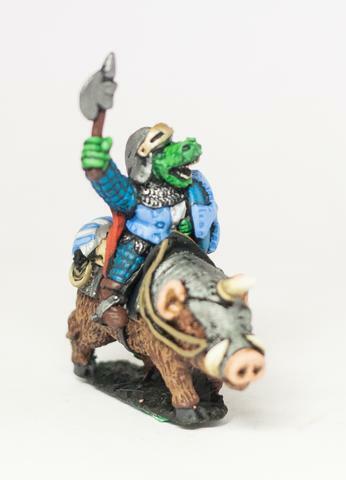 I've got a soft spot for Essex's Great Scaly Orcs. They're crude but charming and oh-so-old-school. OK, so they're not identical. But they're pretty close. 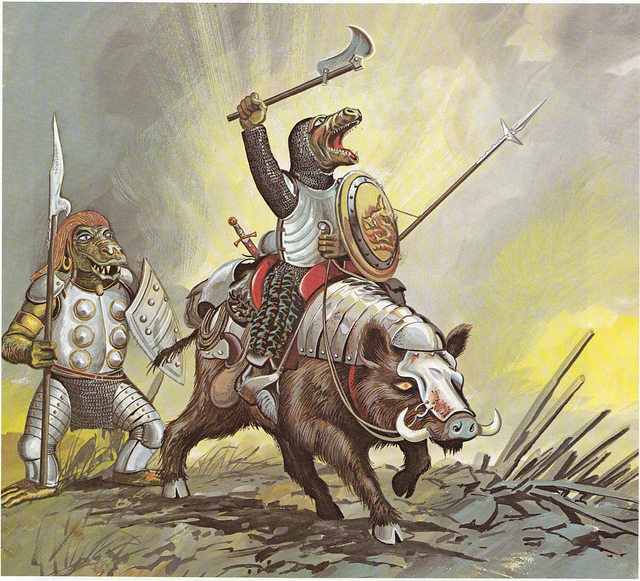 And if you compare the other orcs in the range with the illustrations, the influence is obvious. All of which makes me like the Essex range even more, in all their primitive glory. I'm currently constructing a Tunnels and Trolls dungeon. One thing is certain: it will contain a tavern. I've loved the idea ever since I chanced upon a copy of that 80s curiosity Down in the Dungeon. 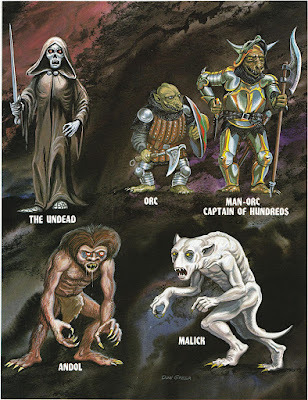 That book, by Rob Stern and Don Greer, is a sort of D&D cash-in that I once perused in print long, long ago. A primary-school friend's older brother's friend owned it, or something like that (as seems to be the way). 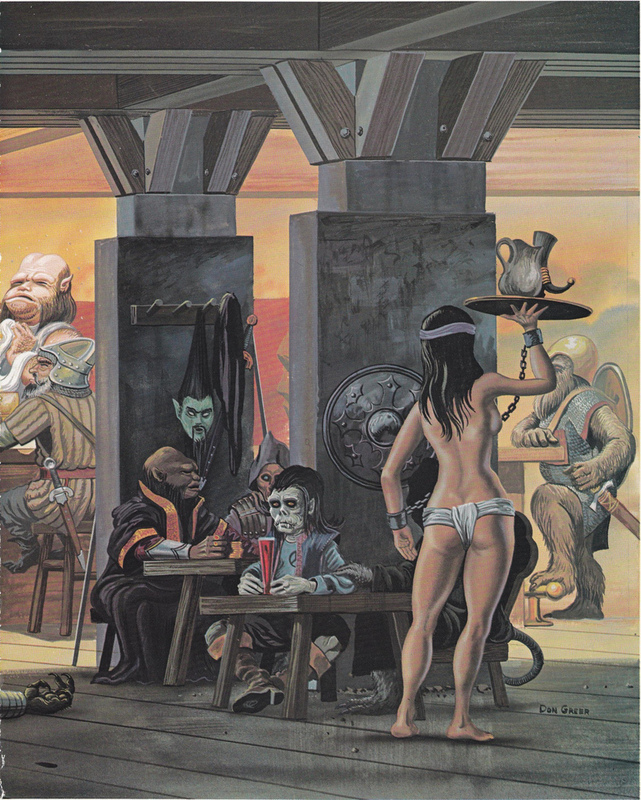 The tavern is a hackneyed staple of traditional RPGs, of course. Superior examples of the trope are Gimpy's Tavern in Pavis and Apple Lane's Tin Inn. But rather than a starting point or brawling ground, a dungeon pub could be something much more interesting. The first of the boozer illustrations in Down in the Dungeon is entitled Neutral Ground (see above). There's your starting point. This is a place where the normal rules don't apply. The idea of members of various dungeon factions and adventurers sharing a drink is just irresistible. Those orcs you fought at the Skull Gate? You might meet some of them in here. But they'll be off duty! They might just be prepared to let bygones be bygones. Or they might have a bone or two to pick. There are probably bouncers to keep the peace. 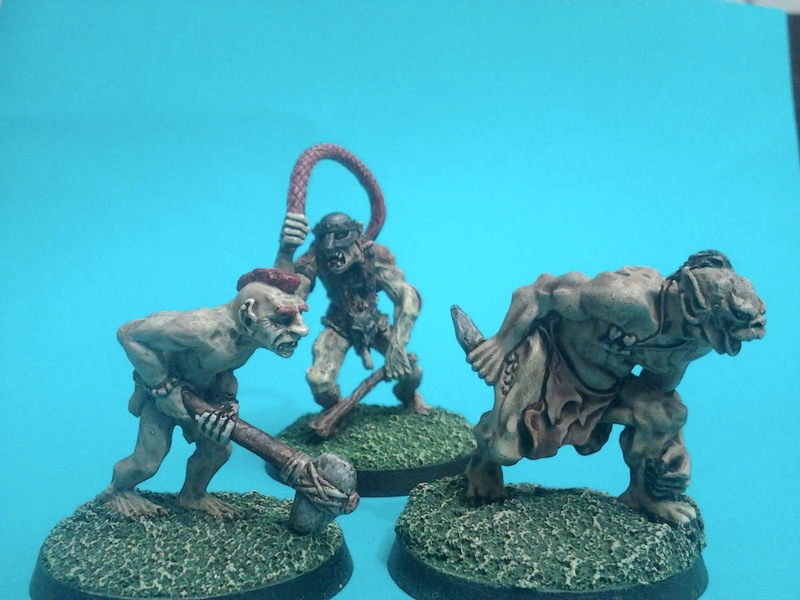 Ogres, perhaps. Or automata of some kind. In any case, it's doubtless a fragile peace. But still, you might get a chance here to buy that scarred orc veteran a couple of pints and maybe loosen his tongue. You might even find out that the Skull Gate is unguarded on certain occasions. 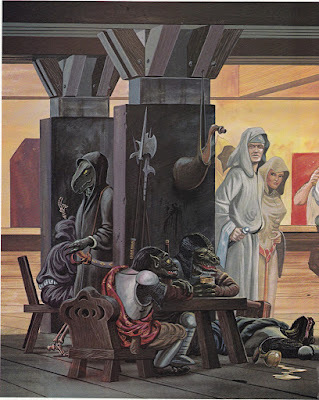 The obvious template (and as the Grognardia blog suggests, probably the inspiration for Neutral Ground) is the Mos Eisley Cantina in Star Wars. 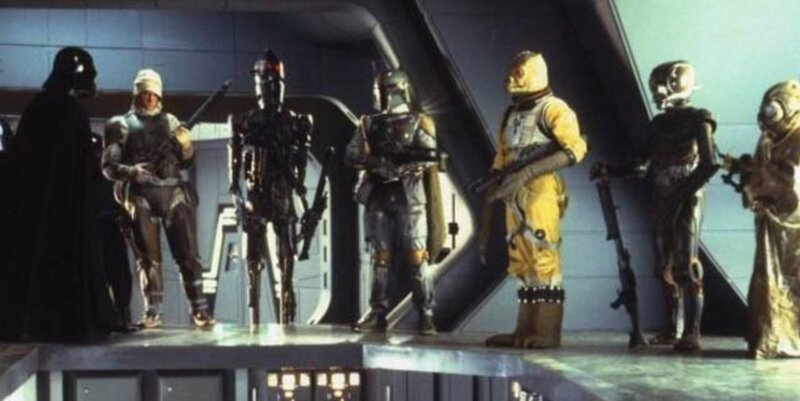 For what is a dungeon but a hive of scum and villainy? And what do scum and villains like to do? Why, drink, of course. So what can we take from Mos Eisley and apply in our underground tavern? 2. We don't serve their kind in here. This isn't a nice place. Some beings just aren't welcome. Elves might be an obvious example. But it might be more amusing if (say) dwarven PCs are denied entrance even though there are lots of other dwarves quaffing away inside. Or half-orcs being barred despite both orcs and humans being served. What we want here is something arbitrary and irrational that leads to improvisation by the players (one dwarf on another's shoulders under a long cloak; a half-orc trying to pass as a whole one; an elf improvising some sort of disgusting disguise). The particular strand of barroom bigotry needn't be explained, though it could be. And the prejudice might shift from one visit to the next - to test the players' creativity or simply to torment them. 3. Most of the best freighter pilots can be found here. That famous smuggler you need? You'll find him at the Underworld Inn when he's in town. This is the place to meet NPCs who need to lie low. 5. This place can get a little rough. ... and so should NPCs. The PCs might have the opportunity to help out an NPC, thus earning trust or gratitude. 6. Sorry about the mess. Whatever happens, the patrons and management have seen it all before. Throw a few coins down on the bar, and no one will say anything. Now, while the dungeon pub is certainly gonzo, it needn't be goofy. The obvious parallel is with a fairy or goblin market (see Christina Rossetti, Jack Vance's Lyonesse and Hellboy 2). The irrationality of the prejudices in 2. above could be played up nicely as a sort of fairy whimsy. But what else could we add? Well, if we take the fairy aspect (through a Vance or Susannah Clarke filter, perhaps), we could have a lot of fun with the drinks. So what's on tap? This is terribly, terribly moreish. After one pint, you'll want another - unless you can make a Luck save (T&T) or a Wisdom save (D&Dish systems). If you fail that, you'll have a penalty on the next save (a higher-level save in T&T), and so on. It costs you money (price to be determined by GM). And when you run out of money, you'll want to trade gear, weapons and armour. It also it temporarily reduces your CON by a point for each pint drunk. When that reaches 0, you pass out for d8 hours. If you make your save, you succumb to a fit of violent retching. The CON points return at a rate of two an hour thereafter as you sober up. This is delicious. The trouble is, it relaxes you with its rosy glow. You feel so good that you just have to tell anyone you meet what you're doing and why. "We're planning to come back on Seventh Night to go through the Skull Gate - because it isn't guarded then!". Drinkers of this wine tend to attract an audience. It's very tasty, but it makes you violent. Very violent. It achieves this through a weird inversion of reality. If a drinker fails a CON save (-1 for each pint), he or she will perceive a random stranger in the bar coming up to them and issuing a challenge ("I don't like you", etc.). In fact, though, the drinker will have done precisely that to the stranger. Mayhem often ensues. This makes the drinker very convivial but also inclined to boast. I'd leave this one to the player's ingenuity - with XP or cool points for truly epic bragging. Think Bombur in Mirkwood. Slumber wine is a powerful restorative (recover 1 HP or CON point, depending on system, per goblet), but it isn't meant for mortals. Make successively more challenging saves with each glass or fall into a deep, deep sleep for 6 + d6 hours. While asleep, the character will occasionally chuckle or smile contentedly. This is also a restoring drink, but it tastes awful: fiery, astringently herbal and cough-inducing. A CON check is needed to keep it down, but it restores 1 HP/CON point per flagon. Failure to "take your medicine" will attract raucous mirth from nearby orcs. Half-orcs may benefit from the drink without requiring the check. This is a pleasant-tasting ale. It appears light, and it's cheap. Each pint reduces the drinker's DEX by one point - but it only takes effect when they rise from the table. They will then be hit by the full penalty immediately. Points are recovered at the rate of one an hour thereafter. This is refreshing. But make a CON test (with successive penalties) for each pint or feel an urgent need to urinate. Once this starts, it will recur every few minutes - and in all stressful situations - for D4+1 hours. This is a wholesome drink (recover D4 hit/CON points per session, regardless of how much is drunk), but it reddens the skin remarkably. The effect is cumulative; one flagon makes you look a bit flushed. By the time you've had six, you'll have gone full Hellboy. The effects are (d6): 1-2 measured in hours per pint; 3-4: days per pint; 5: weeks per pint; 6: permanent. This is erudition in a glass - at the expense of your physique. Each serving takes a point from your ST(R) and adds it to your INT. It's a truly delightful drink, though - you'll need to make an INT save to stop. This gets easier, though, the more you drink. It has no effect on those with elfin blood. After going through T&T's character-generation procedure with the kids, I was struck by how artful the game is in making its characters distinctive - through something as simple as its famously recherché list of arms and amour. The best weapons are expensive. But beside the strain they put on the budding adventurer's budget, they also require exorbitant levels of strength and dexterity to use properly. As I noted before, this is hardly rooted in realism. It does mean, though, that characters are forced into peculiar niches. You have to balance the need for armament with the need for armour and other equipment, and reference that against your ST and DEX levels and the amount of weight you can carry (not forgetting to leave room for loot). So a strong but clumsy warrior with ST 14 and DEX 6, and100 gp to spend, might blow most of his budget on an oxtongue spear (about the most damaging weapon that he can wield to full effect), an open-face helmet, a set of clothes and a pack. 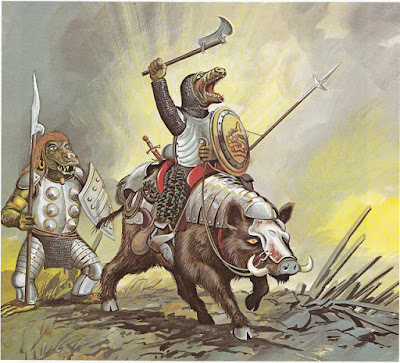 Meanwhile, the reverse (ST 6 and DEX 14) with 150 gp could tool up with a terbutje (a shark-tooth-studded 'sword), a staff sling, leather armour and a buckler. That's about the best she can do in the circumstances. ... but getting there (after 20 minutes' touch up). 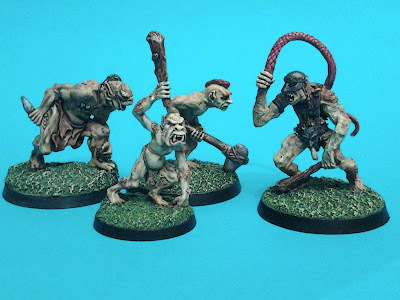 These would be OK on the table, I reckon. I might do some more to the eyes (yellow ink wash and - perhaps - pupils). And some insignia or markings on the shoulder pads might help. Large parts of these - the shoulder pads and the edging on the tunics - aren't really painted at all. But for a quick approach, I don't think it really matters so long as the faces stand out. I haven't done much miniature painting lately. But at around 11 tonight, I thought I'd make a start on these fellows. Here's where I'm at a couple of hours later. I'll finish them off tomorrow - just a white drybrush over the bases, black edging and lining, some highlights on the metals, and then the eyes and other details. The Easter holidays loom. And that entails portable family gaming in case of rainy days or evenings in. We usually take a board game or two with us when we go away, but it's good to have some theatre-of-the-mind RPG stuff on hand as well. 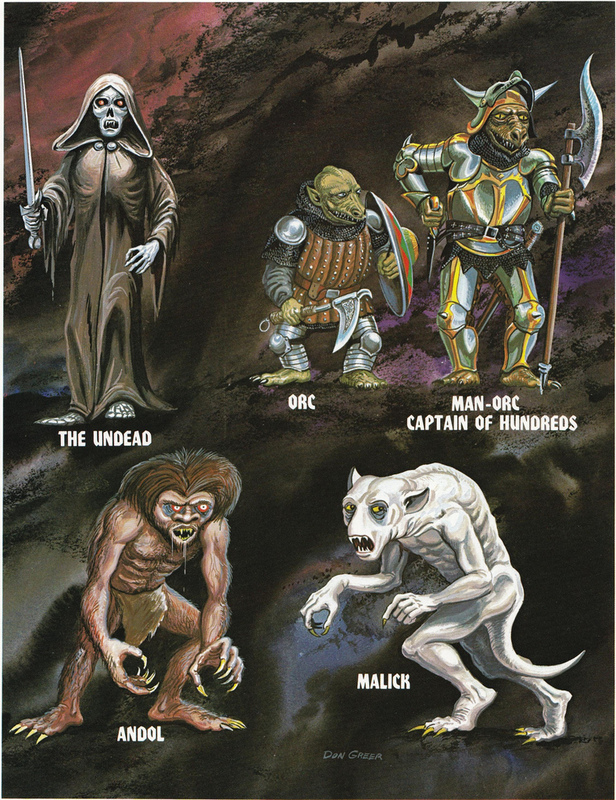 'Theatre of the mind' is how I played most RPGs in my youth; I can recall only one or two scenarios for which we used miniatures consistently. For most of the games I've run since returning to gaming, though, miniatures have been the default. We have lots of them, and they do help with large parties and younger players. But most of the best games I've run in the past few years have been the miniatures-free sessions: an excursion to Hell in Heroquest Glorantha; a delve inside the slowly reanimating skeleton of a kaiju-like behemoth using Dungeon World; and a Whitehack scenario involving an insectoid scientist and his time-bending, terraforming experiments. The advantages of miniature-based gaming are obvious: visual scene-setting and tactical possibilities. The disadvantages are fairly clear too: every encounter looks like a wargame; the imagination is constrained by the limits of terrain and tabletop; and a huge amount of time and effort is needed to keep things fresh. That's especially true of games with kids: "We killed that orc last time!". 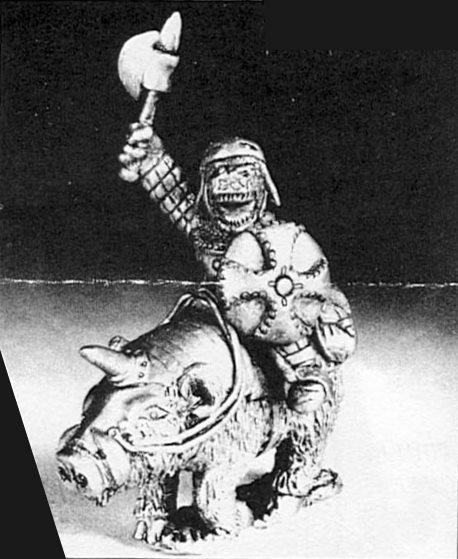 There's one hoary RPG that was clearly designed without regard to miniatures: Tunnels and Trolls. I don't think I ever actually played this as a kid, but I often borrowed the rulebook from a friend or from the library. I recall being slightly baffled by it. The combat system seemed to be arbitrary to an undesirable extreme, despite the huge list of exotic weapons. And then there were those silly spell names. So it remained an unplayed oddity. I decided to give it another look and bought the PDF of the fifth-edition rules. And, with adult eyes, I like what I see. It's amazing how advanced the game appears now. In many ways, it's similar to Dungeon World. Its 'saving throws' provide a universal, 2d6-based mechanic - or near-universal, as it's not the default for combat or spell-casting. But it is applicable to combat, as it covers any special ploy you attempt. A great thing about the saving rolls is that they're heavily based on the character's core attributes. So DEX 11 is better than DEX 10, and so on. That's a huge advance on just having bands of modifiers. Also, the combat system looks much more interesting than it did to my youthful and Runequest-jaded eyes. The default is that each side rolls damage (based on weapons and 'adds' derived from character attributes), and then the losing side takes the difference in actual damage, split equally between the parties. That sounds simplistic. But there are plenty of hidden subtleties. For instance, while damage is shared out, not all characters will be equally able to absorb it. 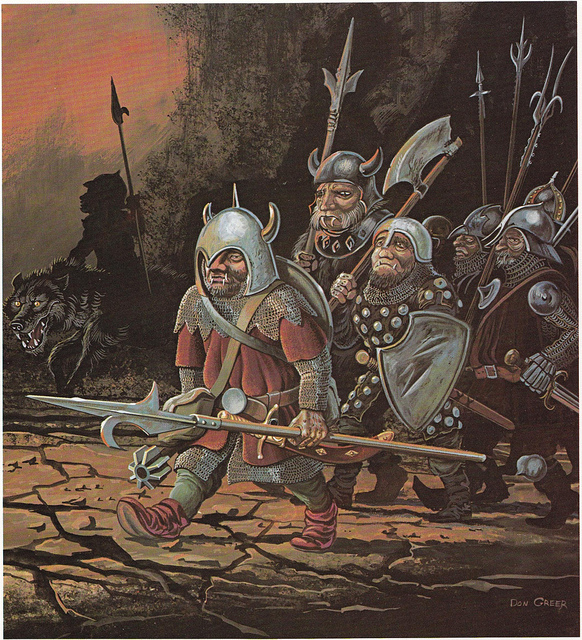 A plate-armoured dwarf with a CON (hit points) of 32 will laugh at all but the highest doses of damage. But an unarmoured wizard or lightly armoured rogue will often have to back out of the fight to stay alive - which means that any future damage will be focused on those still left in the fight. So that near-invulnerable dwarf could soon be in a lot more trouble. And it's clear that those sudden switches in situation will lead to the attempting of death-defying feats, which is where the saving rolls come into combat. There's also a simple mechanic that makes wounded monsters weaker, which in turn encourages the DM to do something unexpected on their part - or simply let them flee the field. That 'death spiral' adds a nice touch of realism and mirrors the 'don't stay in the kitchen' aspect of PC combat. Rolling up a few characters with the kids has illustrated some other nice aspects of the game's design. Arms and armour are pricey, and characters will typically be much worse equipped than their counterparts in many other RPGs. That provides ample motivation for dungeon-crawling. My son rolled up a dwarf of formidable physique (ST 22 and CON 32), but could only equip him with a short sword, a face-mask and gauntlets. I like the open nature of the attributes, too. While dwarves will start off strong (2 x rolled ST and CON), all characters can increase their stats as they gain levels. And higher ST and DEX will allow them access to more powerful weapons. That's hardly realistic, but it makes for a great game incentive; if you want to wield a greatsword effectively, you need to get your ST up to 21 and your DEX up to 18. That's more easily done than in many other games that incorporate training (e.g. RuneQuest), but it will still probably take a bit of work. And if you're happy to throw realism out of the window (two-handed swords aren't that heavy, and wielding a weapon with two hands is probably easier and more natural than with one), then it all works fine. As for magic, the silly names don't bother me in the slightest now - Take that, you fiend! is probably a better name than D&D's Magic missile or RuneQuest's Disruption. All three games require a bit of thought about how these spells are actually described 'in universe', so T&T's light-hearted approach is neither here nor there. If you want a dark sword-and-sorcery flavour, just have the wizard describe the effects of their spell. And actually, in the holidays, we might just go with the T&T silliness in all its Pratchety charm.